Andamiro has released a new set of collectible cards for it SpongeBob Pineapple Arcade. The Series 2 features the same characters from "SpongeBob SquarePants" TV Show featured in the first card set, with different poses, colour themes and "biographical" snippets for each character. The cards in both sets hold the same ticket values for prize redemption operators. 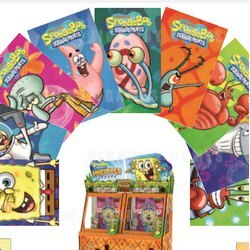 There are nine cards in each SpongeBob Pineapple Arcade collectible series, with Gary the Snail retaining his top rank as a rare card with the highest ticket value. Other characters include SpongeBob SquarePants, Sandy Cheeks, Squidward Tentacles, Patrick Star, Eugene H. Krabs, Sheldon J. Plankton, Larry the Lobster and Pearl Krabs. Entertaining images of Nickelodeon's characters feature on the front of the cards, with fun facts about the characters "Life Goals" and "Most Likely To" printed on the back. The SpongeBob Pineapple Arcade was introduced in 2015 as a tokens-and-cards pusher machine. Players roll tokens down the playfield into moing pineapple targets. The pineapples (which resemble SpongeBob's house) drop tokens, cards and bonus tokens onto the playfield. The cards are then distributed around the playfield and the player msut attempt to knock these cards off the support tray. Players can then trade cards for tickets, or hold onto them until they have all nine collected.